I admit that this review is going to be a bit biased. As I’ve said before, when I read Edgar Rice Burroughs’ Martian series as a teenager it had a massive impact. My life-long love of SF and Fantasy can be traced back to that summer in 1974 when I first came across A Princess of Mars in the UK NEL edition with the Bruce Pennington cover. I longed then for someone to make a film of the book, even though at that time SF movies were uniformly dire. It’s interesting to learn that several people toyed with the idea but didn’t go ahead because the cinema technology of the time couldn’t match the vision of the books (essentially if you wanted aliens the best on offer was Ray Harryhausen’s rubber puppets, or extras in monster suits). Anyway last night I saw John Carter in 3D IMAX and loved every minute of it. However, and this is a massive caveat, it is a fanboy’s film. If you enjoyed the books and know the story it is wonderful to see the places and characters brought to life on screen. If you come to the movie cold then it’s a sprawling mess with a load of confusing names and a plot that doesn’t make a whole lot of sense. In that respect it is like Lord of the Rings. Plenty of people I know who are unfamiliar with Tolkein disliked the movie trilogy. Without the background knowledge to fill in the gaps they found the incessant parade of creatures, people and fantasy history baffling and tedious. 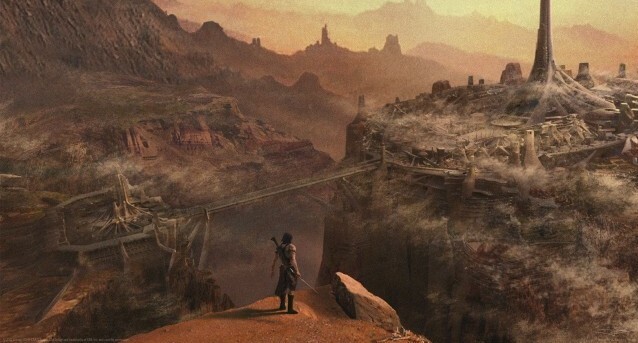 John Carter is even more difficult. Whereas Lord of the Rings had dwarves, elves and trolls, which people recognise from fairy tales, John Carter has Tharks, Thoats, Therns, Calots, Zodangans and Heliumites. WTF? 1) The visual feel is spot on. The producers have gone all out for the 1920s pulp SF look with steampunk flying machines, walking cities, gladiator-style uniforms and jaw-dropping art deco interiors. It’s hammy, but it’s supposed to be and it works. 2) The makers of the film have paid full reverence to the source material. As I said, the drawback of this is that the audience also need to know the stories to make sense of what is happening and appreciate the attention to detail. Furthermore the source material is a mess in terms of plot holes and general structural coherence and this comes across in the film. 3) A great bunch of actors, but many are wasted. Taylor Kitsch and Lynn Collins are perfect as John Carter and Dejah Thoris, and Willem Dafoe makes a smashing Tars Tarkas. The other actors (Ciarán Hinds, James Purefoy and Mark Strong) are woefully under used, with no real character development, which brings me to my next point. 4) It would have worked better as a Battlestar Galactica or Game of Thrones TV series. At times things seemed rushed. In one sequence John Carter and Dejah Thoris journey on the mighty Iss. In the books this is a huge thousand mile long river that empties into the Lost Sea of Korus where sits the fortress of the Mighty Therns. In the film the characters seem to sail half a mile down a small stream to find Plot Point no. 4 (spangly blue map of the solar system in a giant wicker basket) before paddling back again, all in the space of about 15 minutes. Important characters (James Purefoy’s Kantos Kan, for example) are pushed on screen and then whisked off again without any real time to develop. So all in all my 13 year old self was happy and it was quite an emotional moment to see something you’d dreamed about as a child come to pass with such brio. As far as sequels are concerned, the prognosis isn’t great. The film’s takings in the US are poor, though it has done better in the international market, ending up with just over $101m after its opening weekend. So we may yet journey down the River Iss to the land of the Therns in The Gods of Mars. I’m also a huge Edgar Rice Burroughs fan from when I was 11 and 12. I was excited to hear the movie was being made. I was disappointed in it. It had some good things going for it, enough to see how amazing it could have been. I agree, the feel was great. I enjoyed the Tharks. And the imagery. The whole thing seemed too rushed and choppy. But I could have got over those flaws. Like you, I found many of the characters weak. Although I wanted to like Lynn Collins as Dejah Thoris, I didn’t find her convincing. And the jumping and depiction of the Woola were just irritating. You compared it to Lord of the Rings. Even though some die-hard fans were disappointed with Lord of the Rings, the quality of was much better than John Carter. I’m glad I went to see John Carter in the theatre. But I wish it would have been done even nearly as well as Lord of the Rings. Now I’m inspired to find some of the old books again, and pass them on to my kids. I was definitely watching John Carter through rose tinted glasses, and filling in the missing bits in my head. I’m a massive LOTR fan as well and I found the movies faultless. John Carter seems to have suffered a lot from poor marketing (e.g. the Disney execs dropping ‘of Mars’ because Mars films have a poor record in the box office), with a lot of people confused as to what it was actually supposed to be about. Your review was dead on, exactly what I’d have written..
Hi I am leaving this comment long after your post, or my viewing of the movie. But I am an old fan so I enjoyed it so did my wife who was not. I agree that it was choppy, the whole earth civil war section took up time that would have been better spent on Mars. I found it interesting that they combined the first two book, but then as you said, that meant they did not have time to do some of the material, especially the river scene they took from the Gods of Mars justice. The acting and effects were fine in my mind but it would have been better was a series. I am sorry it did not do well in the theatre because I would have liked to see more of Burroughs works done with cutting edge special effects. ← Peter Bradshaw – I spurn you as I would a Calot!